Here’s another name-brand service for Apple TV: Apple plans on bringing a new app from Vevo, the music video service, to its Web-to-TV box. Vevo is building the app, after getting a go-ahead nod from Apple, and had planned on getting it on the device this month, according to people familiar with the project. But the app will still need final approval from Apple, which has so far only brought a handful of outside programs to Apple TV. The free app is supposed to feature a “lean-back” version of Vevo, with programmed channels, but will also feature on-demand programming. Advertising Age reported on the Vevo app earlier today. Vevo already has apps on a variety of devices, including Apple’s other iOS gadgets, as well as the Xbox 360 and the Roku Web TV box. Roku has what is essentially an open platform, which allows all sorts of developers to create apps for its box. But Apple has a very limited number of outside apps on its box. Last month it brought on five new video apps, including ones from HBO and ESPN. 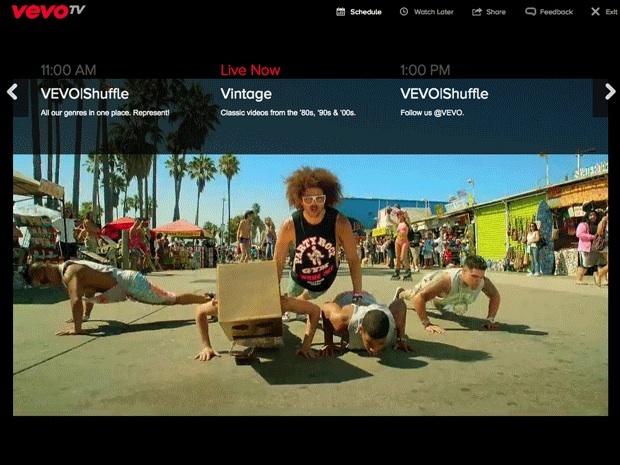 Vevo is owned by Universal Music Group, Sony and Abu Dhabi Media. Google, which is responsible for generating most of Vevo’s views via its YouTube unit, is also an investor.